We got to the gigantic grand prix circuit ready for a weekend that had a recipe for a good result. 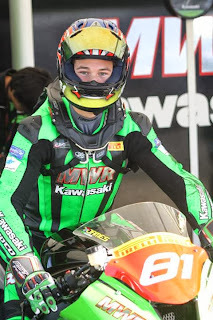 We had tested here once earlier in the year, the bike has been feeling constantly better the past few rounds and we have been making fewer changes, finishing closer to the front each time. I enjoy racing at Silverstone, being a fast and flowing track, so I just needed to learn changes in my race lines and a few other riding bits to suit my super powerful 1000cc Kawasaki to the track. As usual, our ever valuable first practice session on Friday turned out wet and rainy, but unfortunately I had more a grip problem than everybody else... My clutch cover gasket blew on my out lap, and I had a big moment when I got on the power, loading up my now well oiled wet rear tyre! I initially thought maybe the tyre needed to scrub in a bit but after 3 laps of suspiciously slippery corners, I pulled in to find oil pouring out the side of my bike. The session was red flagged and I vacated pitlane hastily - I was that guy, the one who dumped oil all over the track and delayed events by 30mins! It was an unfortunate happening, but the gasket was quickly replaced and we were back in action. After everything was checked on the dyno, we prepped for a dry qualifying 1, not ideal as I had only got 3 laps of practice, but we knew our setup wasn't far off right. We set out on track and the bike felt pretty good, but I had noted a few changes I wanted. With Quali. 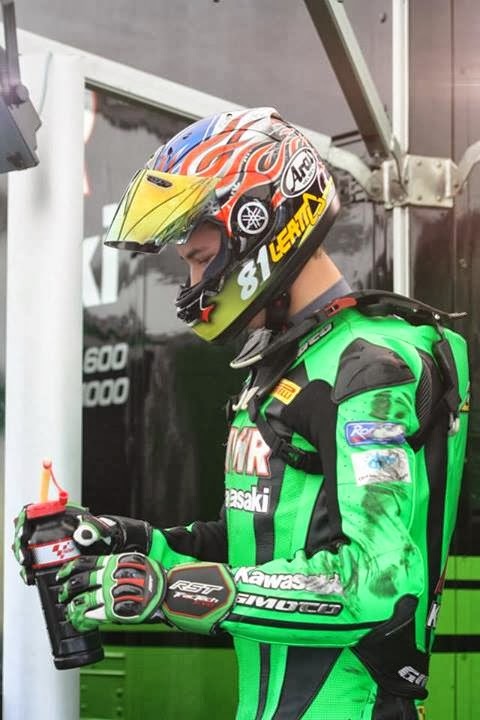 1 being like our first practice session, I wasn't phased with our 33rd position. Saturday afternoon would see us head out for our final qualifying session, confident of improvement, I headed straight out with our new setup and put my head down to get a good feel for the new settings. I pitted with about 10 mins to go, corrected tyre pressures, and took a breather to prepare for a fast lap to get inside the top 30. 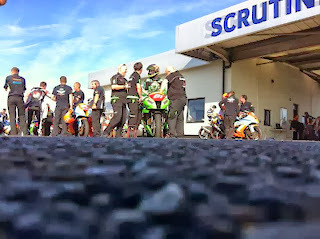 Tyre warmers came off, and I rode out of pitlane onto the massive track. I got a warm up lap in and put my head down to do a time, getting us a 2:13.1 lap time, 30th place. The next lap I knew I had to find a bit more. 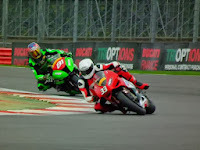 Timing worked out well as I came up behind a cruising Tristan Palmer on his Ducati Panigale. The good guy he is, he saw me approaching and gave me a tow and a slipstream onto the long Hangar staright. The rest of the lap went well and we dipped into the 2:12.7. I got one last lap in and managed a 2:12.5, getting us 27th place for the race - happy with the lap time, only 2sec off pole position, which around Silverstone, is more like 1sec on a normal size track, the closest we've been all year! Unfortunately the nature of the class is so competitive, the positions are filled by many with such small amounts of time! I noted a few changes I wanted to try in warm up before the race, and after the team had the bike prepped for Sunday, we headed out for a good team meal! Sunday was upon us, I liked our changes and I was keen to get to the start line. The lights went out, and I got probably the best start I've ever had, catapulting from 27th, up to the top 20 by turn 1. 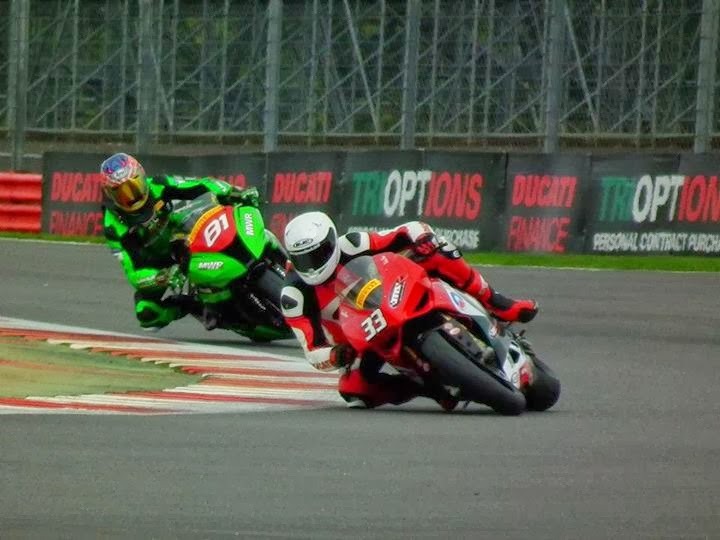 I passed a few more people into the next series of corners before the long back straight. 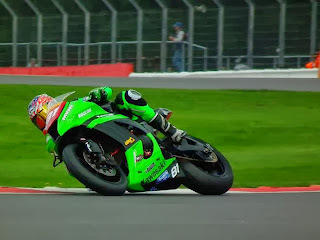 Luck would have a rider about 2 bikes in front of me have a big moment as we got onto the straight, forcing me and a few around me to hit the brakes to avoid him, letting all those people I had just passed, back past as I furiously tried to regain the positions. 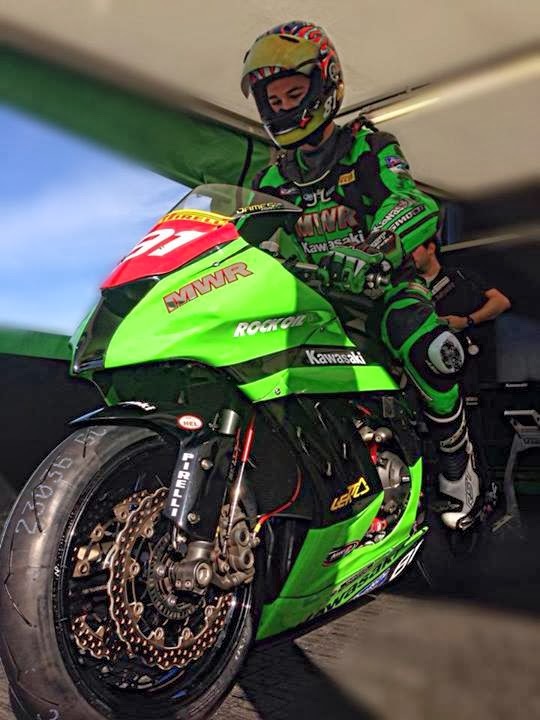 The bike was feeling good, and we were lapping over 0.5s faster than qualifying. We were up to the top 25 and chasing down the top 20 consistently, and with 1 lap to go, I managed to close in on 19th place but couldn't make the pass stick in the last corner and we got our 20th place finish. 20th is not our position best finish, as we had 16th at Donington Park in July, but this was the closest we've been to the podium in time behind the winners, in reality making it our best finish! We dipped into the 2:11.9 lap time twice in the race and ran low 12s all race long, making us only 1sec off the 2nd placed Hudson Kennaugh, who is also the championship leader! I really like the way the bike's handling now, it's more familiar to how I've always set my bikes up to my style, as opposed to how we we've been trying to set it up following general setup info for Kawasakis, which I battle to get comfortable with. 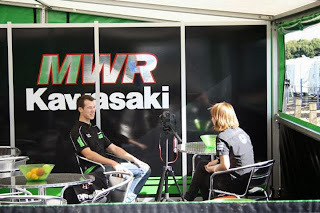 A big thanks to Mark and our whole MWR Kawasaki team, Dan and Jason for the bike setup, Donna & the girls and everyone supporting us! Our great sponsors (doubling as parents) Mom & Dad, Rocket 88, Leatt Brace, RST Race Suits, Arai Helmets, Clayton Francois of SA Racers and all our team sponsors. 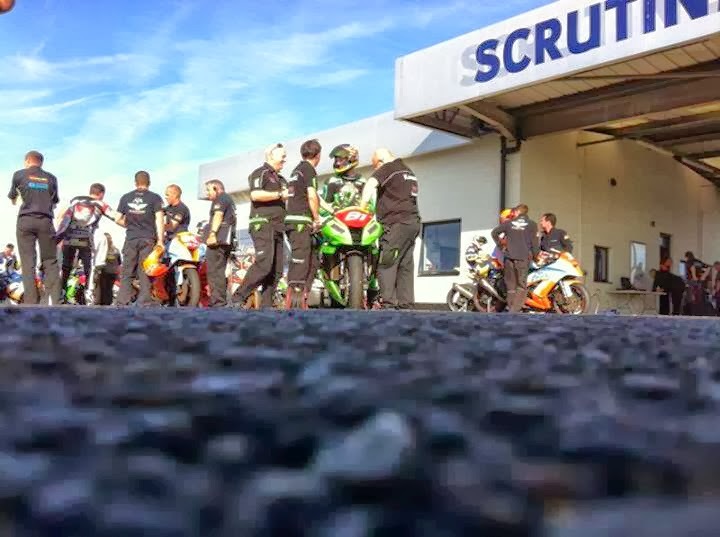 The final round of the series comes upon us next weekend (20 Oct 2013) at the legendary Brands Hatch GP circuit, and our season draws to an end, ALREADY! My dad will be back for this round, I'm sure he can't wait to get back here and back to the race track again! This season has just disappeared and I feel like we've run out of time, wishing we had a few more races to get some solid position results! 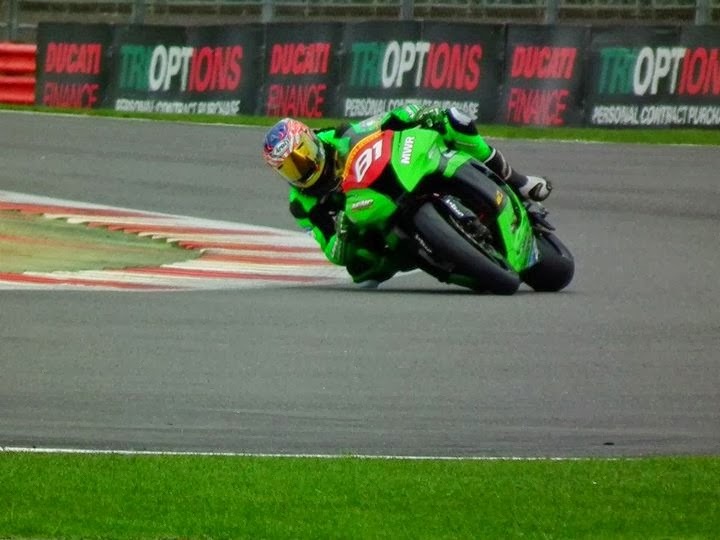 I'm looking forward to getting to Brands Hatch and back on my ZX10R with my Dad again!